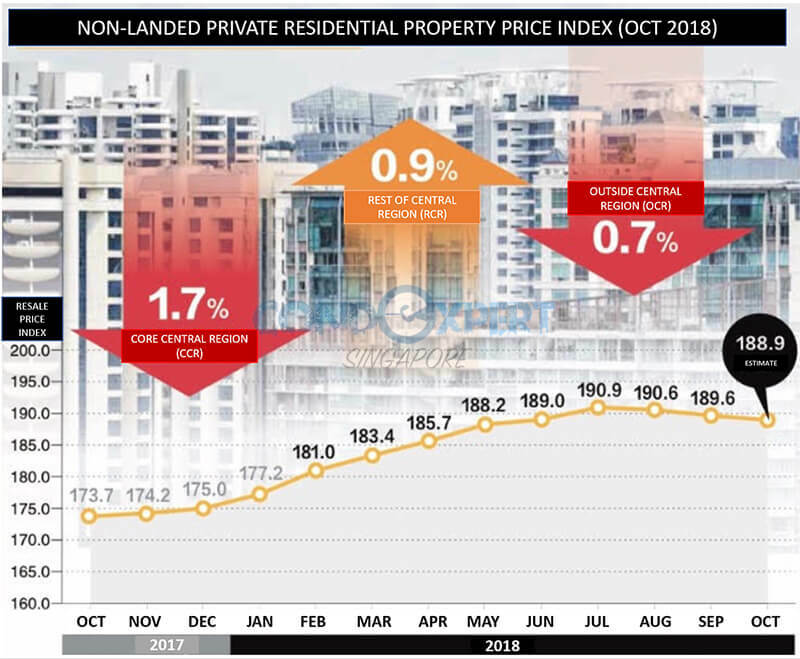 According to flash estimated from SRX Property, prices for resale properties in Singapore for the non-landed residential segment have fallen for the third consecutive month in October 2018 after the new property cooling measures were announced in July. Resale prices of private apartments and condominiums in Singapore have declined by 0.4 percent in October, following 0.5 percent and 0.2 percent dips in both September and August respectively. Before the month of August, Singapore property prices in the resale segment was on a 12-month consecutive rise. Presently, the resale condo prices are still up by 8.7 per cent year-on-year as compared to figures from October 2017. But prices have fallen by 1 percent in the last 3 months since reaching new heights in July – which was when the new cooling measures were introduced. It was noted that buying sentiments in the resale property market remained flat. In October 2018, a total of 703 private homes changed hands – a 3.7 per cent increase from the 678 units transacted in September. However, it is 53 percent lower than the 1,497 private resale homes sold in October 2017. Based on property consultants and condo experts in Singapore, there seems to be a ‘standstill’ between home buyers and sellers as the differences in their expectations stretches further apart. It is a typical situation that sellers are holding firm on their asking prices while buyers are anticipating prices to head south and continue to moderate after the most recent property curbs. At this point of time, it is still uncertain and where property prices will be heading and some private homes on the resale market may require a longer time period to be sold. In addition, activities such as sales and viewings may also be affected due to the year-end holiday season. However, things are likely to pick up again after the holiday period.